Gone are the days of two dimensional printing. It is time to embrace new and improved technologies, in the printing filed as well. In recent times, the craze for 3D printing is on the rise. While traditional printing techniques made use of ink and paper, the 3D printers can create amazing structures with additive or special gum. Apart from gum, the printers also use glass, ceramic, plastic and metal. As the name suggests, the manufactured shape is three dimensional in nature. The machine produces the designs by applying one layer on top of the other. As the printer is connected to a computer, where the design is fed through software, you need not manually monitor the printing process. It is easy to make changes in the design as all you need to do is alter the data and feed it in the software. Speed – The 3D printers are fast in the production process. So, you can start the manufacturing process as soon as you get your hands on the printer. Single step involvement – Traditional printing process of object manufacturing may involve several steps. But that is not the case with 3D printing services. Every part of the object will be produced by the additive printing. Cost-effective – Needless to say, the 3D printing technology is far less expensive than the use of traditional printing. These machines use as much electricity as a normal laptop does. So, you will save a lot in power bills. These machines can be operated by a single person. Thus, labor charges will also come down as one person can operate many printers. Risk management – It is easy to manage risks with 3D printing rather than with traditional methods. A 3D printer will allow you to produce a complete prototype that is ready for mass production. Thus, you will have a better idea about what you are investing in. Time saving – Unlike traditional methods, 3D printing saves a lot of time and energy. All you need to do is select the software and turn on the printer. Depending in the complexity of the design, the printer will produce the objects within no time. Easy designing – Traditional designing is both expensive and restrictive. There is only so much that you can do, and in case the casts are damaged, you need to manufacture new molds. With 3D printing, you produce complex and intricate styles without much fuss. A vast application possibility – From jewelry designing to architecture, you can make use of 3D printing in a host of other industries. The flexibility that the designing procedure offers will make it easy to produce any shape, without the use of external molds. Understand the venture – 3D printing is still in its infancy. More so, common people and manufacturers do not have necessary information about the trade. Every new business has a different business model. It is not very predominant in India, and so, one must understand the venture, and associated business models before starting work on the startup. Attain necessary information – In case you want to tap into the market, then you must put in enough time into research. It will offer you a clear idea about the perks, applications, business and profit generation scope, risks and its management. It will enhance your knowledge about 3D printing, and its operation. Consult with experts – No matter how much research you do, you will fail to analyze the real-world scenario and associated business challenges until you take part in the business. It is better if you consult with the experts before plunging in the volatile world of 3D printing. Attain the 3D printer – Several kinds of 3D printers are available in the market. The import quality printers are too expensive, while local 3D printers are cheap. The quality of the product will depend on the machine you pick. You can attain these machines from online sites of respective companies, or get in touch with distributers. Acquire raw materials – Good quality additive or plastic is mainly imported. You need to talk to the 3D printer distributers, as they supply raw materials as well. Once you have the printer and the raw materials, you can start sample manufacturing. Prepare the sample – Before you manufacture the product, you need to prepare samples. Once your samples are ready, it is time to see whether there is a ready market for it or not. There is no point in producing something that does not have demand in the market. Turn the prototype in a product – Signing the contract with some service providers is a must before starting the company. These agencies will purchase the product once you manufacture them. Once the prototypes are approved, you can start the task of actual product manufacture. Take customer feedback – As you are making the products for customers, you need to listen to their feedback. If the clients like the products, then you have chances to develop. In case the customers are not happy with any aspect, try to rectify it. Affordability and promotion – Pricing and advertisement are two essential elements, which will ensure success of your business. In case the prices are too high, you will fail to attract more customers. Lack of promotion will restrict your reach in the market, and your target clients will not know much about your presence and products. Primary company registration – Primary registration of the company is a must. It will not only register the name of the organization, but will also record details of shop location. Apart from this, it will also offer the authority details about the owners, their identification and address proofs. Once the owner passes all inspections, he/she will get the registration papers from Municipality Office. Trade license – The Trade license is another important permit that the 3D printing company requires. The license number is necessary for attaining other government papers. Ownership pattern records – The owner needs to submit essential documents, which will highlight whether the company is run by a single person or operates on a partnership basis. As 3D printing is capital intensive, it is best to opt for partnership ventures. VAT documentation – The payment of Value Added Taxes is a must for any company. The owners must acquire proper VAT account details to make the payments without fail. Udyog Aadhar Card – The Indian central government has started issuing Udyog Aadhar Cards for small scale manufacturing industries. Opting for Udyog Aadhar code will eliminate the need for a separate Aadhar Card in the name of the organization. Sale Tax documents – It is mandatory for the owner to submit all relevant documents at the Sale Tax office. It will create a representation of the agency in government books, and ease the sale tax payment procedure. Service Tax papers – Service Tax is another necessary duty that every company must pay. For this, filling service tax forms is a must so that the name of the organization is noted in government system. Bank account – Any tax payment requires proper maintenance of financial records. Thus, each 3D printing agency must open and operate a separate bank account in the name of the organization. All financial dealings, related to the business will be done through this account. Lack of all-inclusive software – The 3D printing machine needs software to produce satisfactory results. But all programs, in the hands of Indian companies, do not have the necessary holistic nature. All programs must be imported. Lack of awareness – Many people are unaware of the presence of 3D printing technologies. Thus, the demand in the market is not up to the mark. The Indian government must create adequate necessary awareness in the market. Expensive machines – It is impossible for small scale organizations to make use of this technology. The primary reason behind this is the high cost of the machines. A basic 3D printing machine starts from Rs. 1,20, 000. Highly capital intensive – Apart from the expensive machines, the raw material is also costly. A significant amount of capital is necessary to setup a business. As most business houses are not interested in taking risks, the development of this industry is slow. Lack of locally produced raw materials – The main handicap that the owners of 3D printing companies face is the unavailability of proper raw materials. High quality material needs to be imported, which is an expensive affair. More focus is needed on production of raw materials, at local levels. As mentioned earlier, 3D printing is a capital intensive industry. It is better to get a credit from the bank to start the business. Several 3D printing machines are available in the market. While the high-end imported stuff can cost anything starting from Rs. 1, 20,000, those manufactured in the country come with a much lower piece tag of Rs. 20,000. But you need to keep in mind the cost of acquiring software, raw materials, space and power. So, an interested candidate needs around 4 to 5 lakhs to start the 3D printing business. The banks offer loans to appropriate candidates at low interest rates, and even the central government has special schemes to assist these entrepreneurs. The huge application scopes, and impressive demand in the market has allowed business experts to predict that the 3D printing sector will double in India by 2020. As these printers were not available in the Indian market, companies had to import these. They had to sign patents for this as well. But currently, many such contracts had already expired or will become obsolete soon. It will leave enough scope for Indian organizations to come forth with their 3D printing machines. It will give a positive boost to the industry, and many independent startups will emerge. In 2014, the industry had already managed to touch the $600 million mark in India. It is expected that in recent future it will only grow. With time, more and more avenues are opening, which require the direct or indirect association with the 3D printing industry. The opportunity for business-to-customer arrangement is very less. The nature of this business allows more opportunities for business-to-business arrangements. 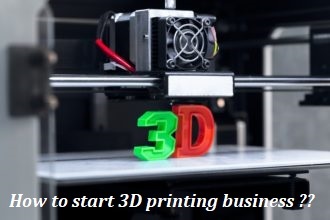 Whether your business is related to selling 3D printing machines or to offer facilities to other companies, it will prove to be a lucrative opportunity, if your business plan is watertight. One has to step into the field to get a first-hand experience.